Pitkin County wants to develop a kayak park on this stretch of the Roaring Fork River along Two Rivers Road in Basalt. The stretch is downstream from Fishermen's Park and upstream of the confluence with Fryingpan River. The Basalt Town Council voted 5-2 Tuesday night to take a tentative step to reducing affordable housing mitigation for developers of new projects. The council majority supported reducing the requirement from 35 percent of a project’s total residential floor area to 25 percent. For commercial projects, the requirement will be dropped from 25 percent of the employees generated to 15 percent. Supporting the measure were Councilmen Bernie Grauer, Rick Stevens, Rob Leavitt, Mark Kittle and Herschel Ross. Opposed were Mayor Jacque Whitsitt and Councilman Gary Tennenbaum. “We shouldn’t be reducing it now when the economy is coming back up,” Tennenbaum said. The time to consider easing the affordable housing requirement was six or seven years ago, when the recession made development so tough, he said. Whitsitt said leaving the requirements the same or lowering them doesn’t address the problem. Workers cannot find housing at affordable rents and sales prices, she said. The study by the town consultant showed that housing prices continued to take a greater percent of income even during the recession. Incomes fell more than housing prices. “We have a huge percentage of poop jobs than we had in 2008,” Whitsitt said. She said relying on developer mitigation isn’t going to solve the problem. The town needs to figure out how to encourage 100 percent affordable housing projects. Pitkin County’s proposal to develop a whitewater park on the Roaring Fork River in Basalt was approved Tuesday night, but kayakers, tubers and paddle boarders will have to wait until 2017 to use it. The Basalt Town Council approved the project, 7-0, but both parties agreed the county will stay out of the river this fall. County officials initially wanted to place features in a 450-foot stretch of the river “for the purpose creating a kayaking, tubing, rafting, and fishing recreation area,” according to the county’s permit from the U.S. Army Corps of Engineers. The work was planned to start in mid-October. The delay was requested for the benefit of brown trout and midvalley residents. 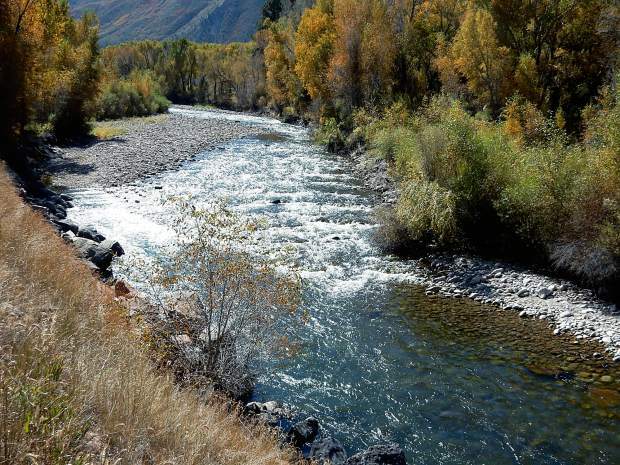 Pitkin County Attorney John Ely said that when the project was first planned, the stretch of river wasn’t deemed spawning ground for brown trout after conditions created by low flows in 2001 through 2003. Conditions have improved in recent years because of higher flows, he said, and Colorado Parks and Wildlife asked the county to avoid placing heavy equipment in the river in October, when spawning occurs. Ely said the U.S. Army Corps permit expires in December, but the federal agency has agreed to consider an extension. The features will be placed in the river downstream from Fishermen’s Park, on the east side of Two Rivers Road. Another reason for the delay is to give the county and town time to engage the public in a river recreation plan for the corridor that includes the whitewater park. That is needed to figure out issues such as providing adequate parking and access for river users, access down a steep riverbank for emergency-service providers and better access for people who want to watch the river activity. It was clear from Tuesday night’s meeting that some anglers also need to be sold on the project. Members of a relatively new organization called the Roaring Fork Fishing Guides Alliance expressed concerns about the whitewater park at the Town Council meeting. “We’d like to see the public more fully engaged,” said David Johnson, a representative of the group. He said one of the concerns is that the water features could create waves that lead to a “washing-machine effect” that could affect the insects that feed fish farther down the stream. Johnson and other members of the alliance also questioned what habitat benefits the project will provide. Chris Lemons, a member of the Roaring Fork Fishing Guide Alliance, said he didn’t want the whitewater park to interfere with fishing. “Why mess with that proven industry with something that might harm it?” he asked. Ely said one goal of the project is to enhance the fishery. Pitkin County is using the whitewater park as a way to secure water rights for the benefit of recreation. The county could exercise a junior water right to potentially boost the water level from 240 to 1,360 cubic feet per second, based on the time of spring, summer and fall. Ely said diversions have drastically reduced water levels on that stretch of river. Establishing a water right for the whitewater park would prevent further diversions and provide more water for that stretch when available. Basalt Mayor Jacque Whitsitt said more discussions will be needed in 2016 to get the fishing industry comfortable with the idea. “It’s kind of No. 1 as far as our economy,” she said. But council members also demonstrated their support of the project. Councilman Herschel Ross said he has heard “more positive feedback” on the whitewater park than almost anything else Basalt has worked on recently. The river work will likely be performed in August.